I am quickly popping in to share the card I make for this weeks Merry Monday Challenge before the linky closes! Last minute as usual for me! 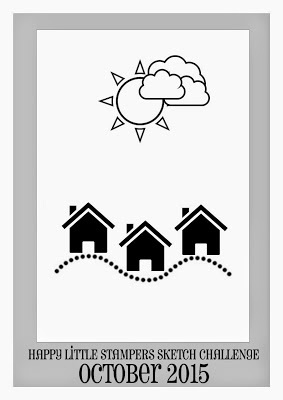 For my layout I used the sketch from Happy Little Stampers. I have had the moose coloured up for a couple of days but haven't had the time to put the card together until tonight. The photo is as good as I would like but it is night time and the card has both acetate and embossing so alot of reflection going on. I will try and take a better photo tomorrow after I finish work. This card just popped right out at me in the Merry Monday gallery. Stunner! Love what you've done here. Love the scene you created! Great card! This is a great card - love the trees and your moose! This is an amazing scene, Andrea! Love this moose and the background is awesome! Thanks for sharing it with us at Merry Monday! 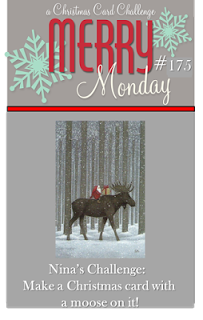 I love this beautiful winter scene you have created, Thank you for joining us for Merry Monday. So cute and beautiful winter scene! Love your awesome design and detail! Thanks so much for playing along at Happy Little Stampers Sketch challenge! What a beautiful card! Thanks for joining us at Shopping Our Stash! Fab card Andrea! Love the moose!! Thanks for joining the SHOPPING OUR STASH crew for our I CAN SEE CLEARLY challenge!! This is adorable! Love the scene you created in the background and that moose is SO cute! This is fab! Love the scene you've created and that moose is just adorable. Thanks so much for playing along with 52CCT this week! LOVE your card! That moose is just adorable! Thank you for joining Happy Little Stampers! This is so adorable! A wonderful take on the October sketch! Thanks so much for playing along with the Happy Little Stampers sketch challenge! That moose is just to cute! Love your card! Thanks for joining us at Happy Little Stampers sketch challenge!